Tom Nelson is not the Thomas Nelson of the publishing house by the same name; Tom Nelson is senior pastor of Denton Bible Church, Denton, Texas, and an wonderfully clear and biblical preacher. Covering 2000 years of church history is no easy task. I’ve listened to many series on Church History and Tom’s is one of the most concise and accessible. In fact, it’s addicting. On a recent road trip I played the first session for my family of six and we listened to 8 sessions. This is a great series that is informative, entertaining, challenging, and refreshing. Know where your theology came from, and download this excellent series on Church History. You won’t be disappointed. I recently spent a few full days traveling by car and passed the time listening to numerous messages by Michael Reeves on church history. 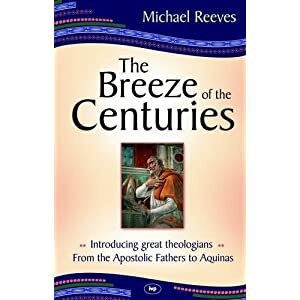 Reeves is an excellent teacher and his Church history series will give you an excellent grasp on the crucial figures, issues and writings of the past 2000 years, from Iraneaus and Justin Martyr to Luther, Calvin and the Puritans. Reeves approach is to break down his talks into particular focuses. First he will talk about the life and historical background of say Thomas Aquinas, and then he will look at Aquinas’ theology by examining his major writings and why they were written. Reeves looks at the following men of Church history: Justin Martyr, Irenaeus, Athanasius, Anselm, Thomas Aquinas, Augustine, Martin Luther, Zwingli, & John Calvin. I highly recommend this series as it helps us to see weaknesses in our present day theology. It’s not easily organized, so you have to poke around the Theology Network site to locate all of Reeves audio messages on Church history. The Andrew Fuller Center hosted a mini-conference in commemoration of John Calvin’s 500th birthday. This is one of many conferences this year that focus on John Calvin and his significant contribution to the church. This is John Calvin the real man, not John Calvin the straw man of popular criticism. How many other preachers in history have seen the attention that John Calvin is currently receiving? Sure, there is a danger of hero worship. But most of this attention is humbly provided and focused on the needs of the church today. Yes, the church can greatly benefit from appreciating the contribution of Calvin. Carl Trueman spoke at the 2007 Reformation Heritage Conference at Grace Presbyterian Church in Douglasville, Georgia. I must say I learned some big things about Luther, particularly regarding his view on transubstantiation in the Lord’s Supper. Trueman does a good job of putting it into context and then explaining how Luther was able to embrace this error. If you have any interest in Luther or the circumstances surrounding the Reformation you will want to give these your attention. Francis Turretin (1623-1687) lived in Geneva during a period of church history that is described as the “high watermark of Reformed theology”. Turrentin is a “towering figure among Genevan Reformers” and has recieved high praise from theologians. Roberts traces the theological battles that Turretin faced, many of which we face today under new names. Turretin battled socinianism, which today we see in the Openess of God form of theology. The generation following Turretin saw the turn toward a decline in strong theology, and in fact, was helped by Turretin’s own son. Roberts delivered this address as the closing lecture of the Free Church Seminary 2007/2008 school year. It is not a sermon, but is aimed at theological students, and will be a dry listen if you’re not so inclined toward seminary lectures. This is the link to the Quicktime, but you will have to click on the sermon or sermon archive page and subscribe to the podcast via iTunes to download this message in mp3. Carl Trueman has given the church a magnificent window on this lofty Puritan John Owen. This will give you a better grasp of this man, his life, his writings, and his theology.